I planned to make this my last vintage make for 2014 but I am flirting with the idea of one more. Anyway, this one has been on the table for more than a couple of weeks, which is a long time for me, although I have been away. The pattern is Vogue 6919 which is from the 1960s, but for which I can’t find an exact date. No matter. I bought the pattern from Circa Vintage in Melbourne and immediately put it in the too hard basket. The sizing is close to mine, but the bust is too small and the hips too big. Eventually I dragged it out of the drawer, found fabric I liked from my stash and got to work. 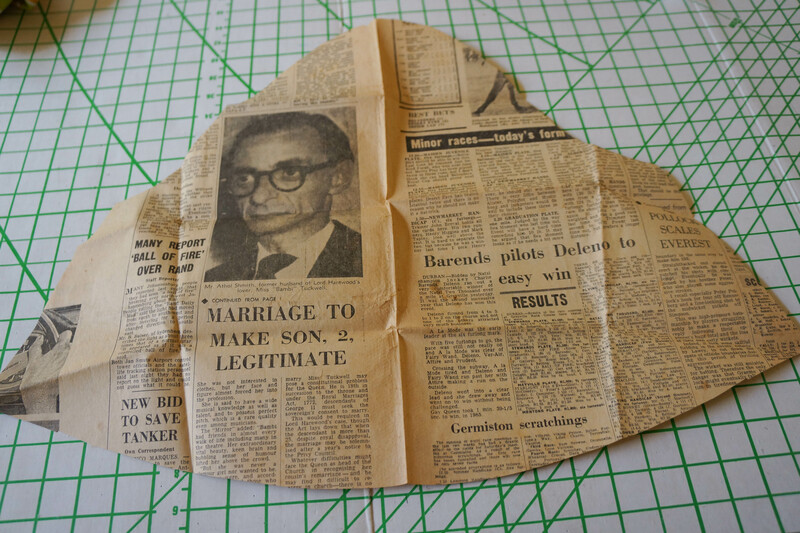 First I had to resize it, which does my head in, then I made a muslin – here is the proof. I can see that the armholes gape a bit, but there is no room to put in a dart in the side seams, although I did dart the camisole underneath. I decided that sleeves might sort the problem out and should have tested this, but had been thinking sleeveless. The rest of it looks ok though. I’ll just mention that my son liked the muslin fabric, which amused me as it is a very old sheet from my single days. I suspect that he likes it better than the actual fashion fabric I’m using! This is an interesting dress. The fashion fabric is underlined and then there is a camisole made from lining material which is attached to the skirt. The bodice is actually separate and is held on via the pointy bit which is slip stitched to the skirt underneath. 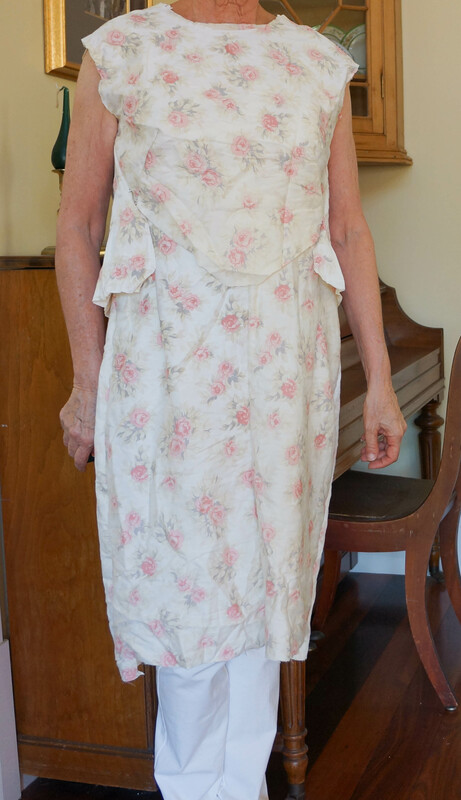 The camisole is high in the front and waist length at the back which meant that I misjudged the length – even though I made a muslin. The danger of checking the muslin with trousers on I guess! I took photos of the muslin, not to include in this post but to give myself a chance of checking issues of fit, so a total fail in the length department. I should note at this point that when I made the actual dress the gaping at the armholes had completely disappeared, but I decided to go with sleeves anyway. The sleeves which are on the pattern envelope are fairly slim, fitted sleeves, but I found this rather wonderful sleeve pattern in with the rest of the pieces, and thought I might use it on my dress, after I had read all the gossip of the day, of course! The sleeve is drafted as a bell shape with a fairly high sleeve head. I did reduce this to get rid of the gathers, but left the shape the same as I thought it was quite indicative of the era. I was really good this time, I tried it on at every stage and all was going well. Then I put it together and found that the over bodice sat brilliantly on one side and not on the other. No idea why as it was perfectly symmetrical, so I pinned in the offending side and refitted it and then had to unpick the side seam (which is that diagonal seam you can see in the pattern picture) and resewed it bringing in the side panel by about 1cm. I love the buttons that I used on this dress. They are from my stash and are from the 1960s so I felt that they suited the dress perfectly. For some reason I used six instead of five, so obviously my spacing is a tad off. I wasn’t originally thinking pink, but the minute I saw them I knew that they and the fabric would work together. The details: Pattern is Vogue 6919 from 1960s, fabric is from Potters Textiles and is a pure cotton lawn in a rather gaudy print. Buttons are also from the 1960s and are from Buttonmania in Melbourne. This dress is all kinds of fabulous! The floral, the colours, the sleeves (they are so 60s) and the bodice held on to the dress at a point! LOVELY! This is absolutely glorious: a total triumph! I love this print and what a fun dress! Good job taking your time and getting it to fit. What an interesting design. I kept scrolling up and down to work out how it went together. I like the back especially. Lovely! Love this dress. this would be a good pattern to do a two tone dress, black & teal, or maybe black and a med shade of blue. That is a wonderful idea, Naomi, I might just do it, thank you! This is a lovley dress, Sue. Very flattering and perfect for the racing season. Yes, wearing to Melbourne Cup lunch tomorrow!